THIS EASTER, INSTEAD OF EGGS, HAVE CHEESE! 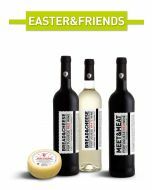 The perfect company to have at the long and full Easter lunch table. Gather the family around that special food that only the grandmother knows how to do and toast to happy days! This pack is the perfect witness to the usual noisy cross-talk. The cured goat cheese, created in partnership with the RTM Group, is obtained from rigorously selected milk that comes from the best herds of the Alto Alentejo.